Time to dump Wells Fargo and other bank stocks? The Wells Fargo fake account scandal is once again causing investors to wonder if big bank stocks are worth all the trouble. Wells Fargo (CBEAX) stock has fallen more than 15% this year. 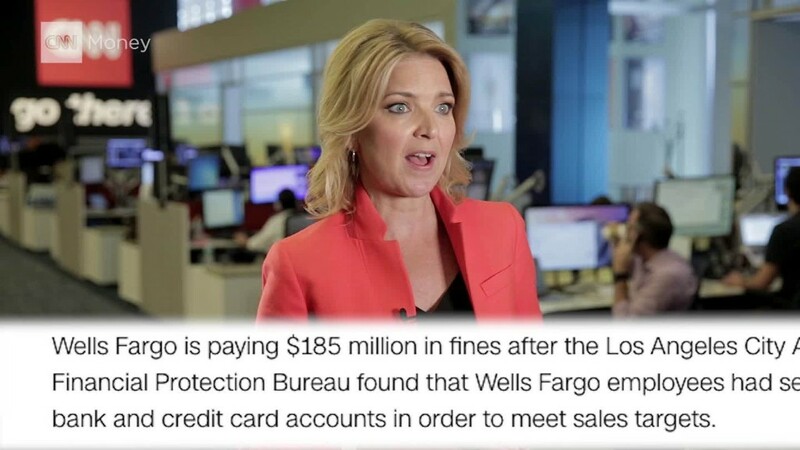 Wells Fargo was supposed to be one of the "better" banks, one that didn't have as many ties to shady Wall Street practices like the rigging of interest rates and foreign exchange markets. Wells Fargo is Warren Buffett's top bank stock for crying out loud. Berkshire Hathaway (BRKB) owns nearly 470 million shares -- and Berkshire has lost about $1.5 billion on that bet since the announcement of the government's fine against Wells Fargo was made. But with Wells Fargo CEO John Stumpf getting grilled in front of Congress, it's fair to ask if it and other big banks now make sense as investments in your portfolio. Wells Fargo isn't the only bank that's struggled this year. Shares of Goldman Sachs (GS), Citigroup (C) and Bank of America (BAC) are all down nearly 10% year-to-date. And those losses are tame in comparison to the pain and suffering being inflicted on the big European banks. Barclays (BCS) and UBS (UBS) have both plummeted about 30% so far in 2016. Credit Suisse (CS) and Deutsche Bank (DB) have each plunged more than 40%. All of these banks are still paying for the sins that led to the 2008 financial crisis and Great Recession -- as well as misdeeds committed after that. Depending on the outcome of the U.S. presidential and Congressional elections in a few weeks, it's possible that the big banks could face even more onerous rules and regulations than the ones already imposed upon them during the Obama presidency. If that happens, the big banks could wind up being nothing more than boring utilities -- slow growing behemoths that pay big dividends but don't offer much more in the way of excitement for investors. Investors seem to have grown tired of all the major risks facing the banks. More regulation. Low interest rates continuing to hurt their profit margins. A sluggish market for IPOs. Concerns that their best days are behind them. Most of the big banks are expected to post annual earnings gains in the mid-to-high single digits for the next few years. That's not necessarily bad, per se. But nobody is going to confuse Wells Fargo and BofA with Facebook and Amazon. Related: When will Warren Buffett break his silence on Wells Fargo? Ultimately, big banks might wind up being more conservative companies in the future as they continue to deal with the aftermath of their bad behavior during the past decade. That also means that their stocks will become a lot more boring too. But it's a tradeoff that's probably better for the broader economy.